Yesterday was the ninth of twelve classes in this fall term. We had been working on all sorts of topics: drapery, still life, shading, three-dimensionality, hands, faces, contrapposto, composition, upside-down drawing, the works. All difficult issues. Why not add more difficulty, I thought, and give them the difficulty of choosing what to work from. 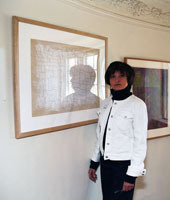 I set up a still life and brought in images of faces & hands to struggle with. And then one more thing: pages from Barcsay’s anatomy book. 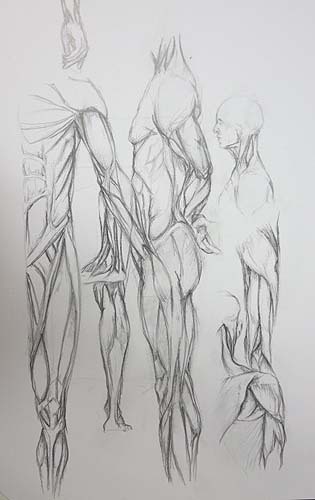 To my surprise, most of the class went for the challenges of anatomy. It’s the driest of topics, but there they were, eagerly gathering around the table where the xerox copies of the muscles and bones were spread out. You get a work out when you try to draw all these muscles in their right place. It’s an accomplishment in itself and a valuable exercise that helps you draw more loosely and with more confidence when you face the live mode. 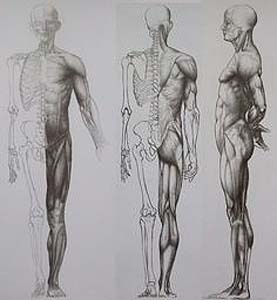 Jenö Barcsay’s (1900-1988) anatomy book has been around for about forty years. I like to use it in class, because the illustrations lack flair and heroism. It’s actually a little boring (just the facts, ma’m) and that spurs a more advanced student on to invent a way of drawing and a way of putting the body parts on the page that perks us up because it feels a lot like art. Killing two birds with one femur.